My title seems like it comes straight out of David Sedaris's Squirrel Seeks Chipmunk. Perhaps I just wish it to be. I warn you friends, what come next may not be suitable for young adults with adult sensitivities. Someone, I'm assuming a janitorial custodian of some sort, cleaned up the weekend rager thrown by the pair of squirrels living the good life in our 3rd floor bathroom. The fluffy-tailed rats sampled every roll of back up toilet paper and trampled ever surface near a water source. Someone cleaned it all up. God bless said person. When I saw that the bathroom had been repaired back to its original dingy luster, I also assumed that whomever had been tasked with the arduous process of cleaning up that Stage 1 rat den would have taken steps to never let this happen again. I know I would have. Not because I am some holier-than-thou workaholic, quite the opposite, I would be too lazy to ever ever ever subject myself to that level of cleaning again. As I pushed through the door to wash my hands before class, the two grey silhouettes pushing their way into the wall let me know that any news of their death had been greatly exaggerated. These fuckers were here to stay. I did a superficial cleansing of my digits and grabbed a paper towel on my way out the door. This was a restroom stop without the "rest." I made a brief stop at my office to collect my belongings and then poked my head into my retired colleague's office across the hall. "We still got them squirrels, eh?!" His face went somewhat slack, the corners of his mouth downturned. This was not the folksy optimism I'd come to expect from my colleague. He said solemnly, "Yah, I found one of them dead in there yesterday." "Jeez," I replied, "Any idea of the cause for death?" "Well I don't know," he began, "but there were razorblades scattered around, and a bunch of cleaning supplies he may have gotten into." Awful. Just awful. 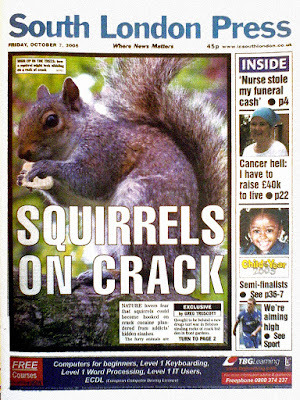 What could possibly have driven this otherwise overly well-adjusted squirrel to go down such a self-destructive path. Razor blades and cleaning supplies!!! That's dark. Was he cooking squirrel meth or something? Did he go out in a Breaking Bad fueled copy cat crime? So many questions left unanswered. What we know for certain is that this squirrel died way too young. Well before his or her time. A squirrel life gone literally and figuratively down the toilet of the 3rd floor bathroom. We also know that said squirrel is survived by at least two relatives, and that this family has no intention of moving out of their cushy rent-controlled lavatory. Squirrel squatters standing in solidarity with their now departed friend. 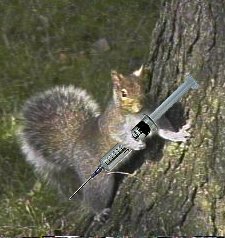 Or, perhaps these remaining squirrels are just customers, hitting up their dealer for a fix, only to find the scent of death and no meth. Last week the Psychology Program Director took his first trip to our humble building. I may have casually mentioned the squirrel soap (literal and figurative) opera going on in our bathroom. He asked me if I was serious. I told him I was deadly serious. Lives had been lost. Two days later a chicken-wire barrier was installed between the sink/closet the rodents were getting in from and the rest of the bathroom. As of this writing, the squirrel have not decided to tear through as if it were butter.